Crewe Alexandra chairman John Bowler says staying in League One was vital to their hopes of continuing to successfully develop young players. The Alex only sealed their status on the last day of the season, ensuring the club a crucial financial windfall. "I would say there's around half a million pounds difference in income," Bowler told BBC Radio Stoke. "That's a significant sum for us to re-invest on the development of young players and bringing them forward." 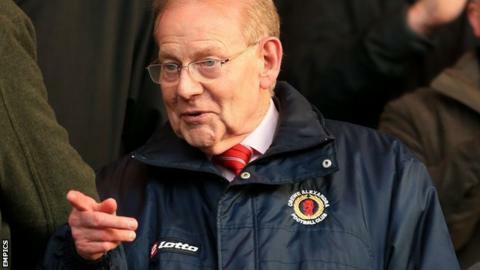 Bowler, who became Crewe chairman in 1987 after seven years on the board, added: "We've always accepted our young starlets when they come through will give us a good chunk of time. "But we always recognised the real stars will go on and play at the top end of the Championship or Premier league - as Nick Powell has done. "If we're looking to compliment what were doing by bringing players in on loan, it's easier to bring the youngsters through if you're in League One rather than in League Two." Powell became the latest graduate of Crewe's heralded academy system to progress up the football ladder when he joined Manchester United in June 2012 in a deal that could, potentially, be worth up to £6m to the Alex. After scoring on his Premier League debut for United, Powell spent this season on loan at Wigan, helping the club reach the Championship play-offs and the semi-final of the FA Cup. In Powell's absence Crewe have carried on blooding young talent, finishing their League One campaign with six youth products in their side. "Our aim has got to be to make our youth development system work," Bowler said. "We've got to find, develop and mature players and be looking for six or seven in the team and 10 in the squad." Alex's 2-1 win against Preston on the final day clinched their place in League One for a third consecutive season but Bowler knows the club face a testing time staying there. "We're not the highest payers and we can't afford to be. We've got to always punch above our weight. "It's going to be full of highs and lows but it won't be lacking for vision or young talent or dedicated management."